South Korea's inflation rate posted lower than the average recorded by member states in the Group of Seven (G7) for the first time in four years last year. According to data by the Organization for Economic Cooperation and Development (OECD), the nation's consumer price index (CPI) marked one-point-five percent on average last year, lower than the two-point-one percent of the G7. It was also lower than the OECD member nations' average of two-point-six percent. It is the first time since 2014 that the nation's CPI posted lower than that of the world's seven advanced nations, which already entered into a low-growth phase with stabilized prices. 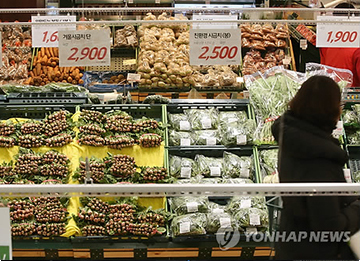 South Korea's inflation remained below two percent for six straight years since 2013. The lower inflation indicates the government's expansionary policies and the central bank's rate cuts have not led to an increase in demand and economic vitality. In spite of the lower inflation rate, prices of products and services closely related to people's lives sharply increased last year, with prices of food products and non-alcohol drinks rising two-point-eight percent.